Ever have those nights when you just don’t feel like cooking? Yes, us too. And often! Want gourmet, scratch kitchen food and not just another fast food dinner? When you’re looking for the best restaurant in Dallas, Texas, you want fresh ingredients. State & Allen always uses fresh ingredients to create some amazing flavor combinations! For dinner, give our Pan Seared Scallops a try, served with roasted corn, pork belly risotto, broccolini, and drizzled in brown butter sauce. Or maybe the Hickory Smoked Quail, coated in a maple-balsamic demi glaze, then served with sweet potatoes gratin. And lastly – if neither of these great Dallas entrees make your mouth water – then what about one of our customer favorites, the Shrimp Fettuccine with homemade pasta, sun-dried tomatoes, and a smoked fresco cream sauce. So creamy and delicious, there is a reason it’s been a staple on our menu for years! Not in the mood to leave the house and don’t want to bother with cooking? State & Allen Kitchen + Bar delivers! As a restaurant that participates in Dallas restaurant delivery, we know ease of ordering is imperative. Simply scroll down on the homepage until you see the Order Online symbol, select your menu options, and follow the simple prompts to checkout. Pretty much everything on our menu is available for delivery: sandwiches, burgers, salads, entrees, soups, appetizers, and more. So the next time you want a great, gourmet Dallas dinner but don’t want to bother with cooking, join us at State & Allen Kitchen + Bar – the best restaurant in Uptown Dallas! Many people think “salad” and they cringe. A salad doesn’t really compare to a filet mignon, but if you order a salad at State & Allen, we think you’ll be pleasantly surprised with what you find. And with New Year’s Resolutions fresh on the brain, why not give one of our gourmet Dallas salads a try! Here’s the thing: we want you to be able to enjoy our salads as an entrée and not just a side or starter. What that means is that our salads are hearty; chock full of delicious ingredients sure to fill you up – without packing on the calories. Try unique protein offerings like portabello mushroom or shrimp. Or maybe add a creamy avocado. And of course, blackened chicken is always a good idea. · Sesame Crusted Ahi Tuna: Perfectly seared rare Ahi Tuna is coupled with freshly chopped Napa cabbage, carrots, radish, cucumbers, jicama, spiced peanuts, and a miso peanut vinaigrette. Crunchy and light, you’ll love this salad! · Warm Spinach & Chicken Paillard: Want something to warm you up on a cold North Texas day? Give the warm spinach salad a try! Chicken, wild mushrooms, purple-hulled peas, sun-dried tomatoes, red peppers, goat cheese, and pine nuts are drizzled in warm olive oil and Balsamic vinegar. It’s healthy comfort food for the win! · The Original Silver Bowl Salad: By far our most popular salad, it’s hard to resist the delicious tastes of the Silver Bowl Salad! Who wouldn’t love a bed of romaine lettuce piled high with spicy chicken, red bell peppers, orange slices, grapes, bacon, and 2 homemade dressings – Caesar and Balsamic Vinegarette?! 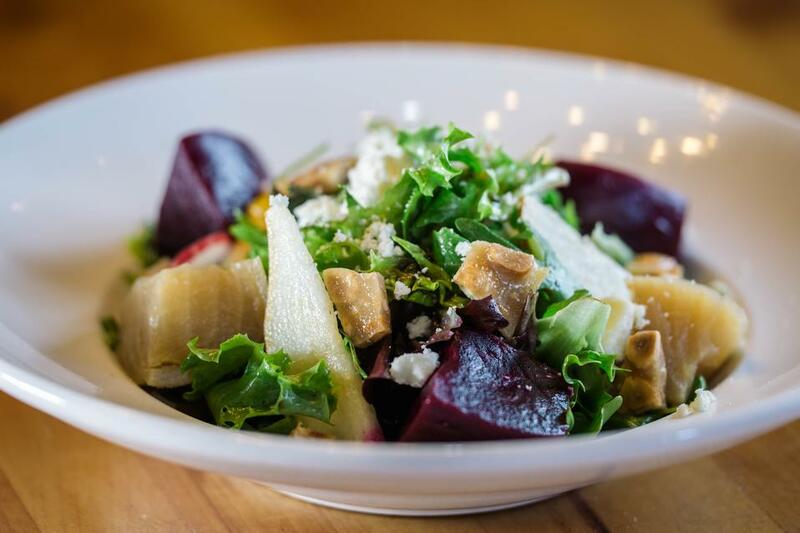 Join us at State & Allen Kitchen + Bar this week for some of the best salads in Dallas, Texas! Scratch Kitchen Cookin’ at a Fraction of the Price: Dallas Lunch Specials at State & Allen! Great food doesn’t have to cost a lot. Especially if you visit State & Allen during our lunch hours and take advantage of our daily Dallas lunch specials! Mondays are a bonus because not only are all of our Dallas gourmet pizzas half off during lunch, but they are half off all. day. long!! Grab a Meaty Meal, Sausage & Wild Arugula, Classic Pepperoni, or just build your own! State & Allen pizza is the perfect cure to the Monday Blues. The chef’s special is just what it sounds like – amazing, farm to table entrees at a fraction of the cost! If you’re feeling adventurous, then this one is for you. You never know what the special will be! Just know it’ll be good. And don’t be surprised if you find yourself back every Tuesday to try the next chef special! A customer favorite, our Shrimp Fettuccine & Fresno Cream Sauce beckons with its rich sauce, bacon, sundried tomatoes, and tender shrimp and pasta. Order it during dinner for $19…order Wednesdays at lunch for just $8.95. It’s no wonder we’re crazy busy for lunch every Wednesday! Fajitas, enchiladas, tacos, etc. – get it all for just $8.95 on Thursdays! You’ll love our homemade salsas and sauces and will fall in love with our meats – perfectly smoked in-house. And don’t expect run-of-the-mill tacos either! Our chefs pride themselves on creating unexpected twists on your old favorites. You don’t have to go across the pond for great fish and chips. Just visit State & Allen on Friday for flaky, tender fish, battered in our special beer batter. Join us this week for Dallas lunch specials at State & Allen! We’ll save a table for ya! Need somewhere to take a special date? Or are the in-laws visiting this holiday season and you want to impress them with an impeccable meal, at a relaxed, comfortable restaurant? State & Allen is the perfect spot for that impressive, gourmet dinner this holiday season. Sure, we have our regular menu items, but have you checked out our Facebook feed? We love showing off pictures of the gorgeous dishes our team comes up with! Each day our chefs are reinventing the menu, offering delicious new specials that will impress even the pickiest eater. How about some Spinach & Roasted Garlic Ravioli, drizzled with a lemon-garlic cream sauce and served with shrimp cooked in a tomato-basil relish? Heavenly. Or our Jerk Flank Steak, served with grilled mango and Caribbean black bean rice. Yum. These are just two of the amazing specials our team has served up this past week! Who knows what will be on the menu next week…but we know it will be good! And let’s not forget about the drink menu at State & Allen. We stock a full bar, loaded with anything and everything you could want to order. Get a glass of bourbon on ice, a craft beer, a specialty cocktail, and more. State & Allen is proud to offer a wide variety of local craft beers, crafted right here in the great state of Texas. We also offer a vast selection of wine to make any and every holiday dinner a special occasion worth remembering. As you are planning your holiday dining experiences this season, remember to come into State & Allen – your favorite Uptown Dallas restaurant - for a dinner you won’t forget! Impeccable meals, served in a casual, inviting atmosphere, are the recipe for a dinner worth savoring.